Happy Fall friend!! With the seasons officially changing, it’s time to turn your attention to nourishing your body for winter. I’ve always been a huge fan of yummy baked goods like breads, biscuits, and the like, but after going gluten-free I found it hard to find ones that actually taste good and aren’t full of junk or that don’t wreak havoc on my blood sugar. Luckily, I’ve experimented with cauliflower in the past and know it can give a pretty great texture and flavour when used in baking (check out my cauliflower wraps here!). 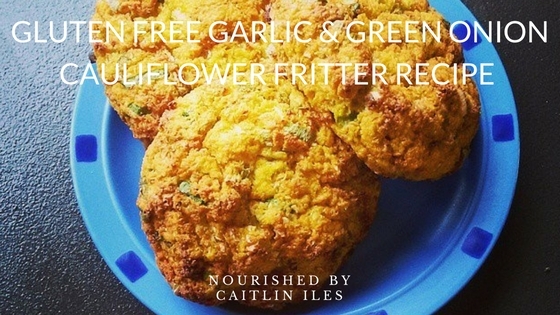 Today I’m going to make some fritters out of rusty trusty cauliflower. I started them off intending to make rolls for some burgers I had made, but I liked the soft texture of the middle so decided to turn them into fritters. I’m going to use this base batter to make some fish cakes eventually, but I wanted to share the basics for you to play with. Cauliflower is a great vegetable to incorporate into your diets as it’s high in fibre and low in simple carbs, meaning it won’t spike your blood sugar. As a member of the cruciferous veggie fam jam it’s also chock full liver supporting nutrients that help with detoxification of harmful estrogens. Having too much of certain types of estrogen in your body can cause a host of unpleasant symptoms, the least of which is weight gain. And what with all the synthetic environmental estrogens working their way into the environment and food supply, it’s more important than ever to support your liver as much as possible. Using coconut flour in the recipe in place of a rice flour or other GF flour helps keep the glycemic load of our fritters to a minimum. Even though alternative flours don’t contain gluten, they can still wreak havoc on blood sugar balance, whose stability is the key to avoiding energy crashes and beauty blunders (read more here!). A word to the wise, coconut flour is HIGHLY absorbent, which is great in this recipe as it absorbs all the moisture from the cauliflower and helps bind it into a yummy treat, but when using it in other baking you will likely have to add more eggs and liquids ensure a fluffy texture. I’ve made the mistake of using it one-to-one in place of other flours in the past and come out with a nice batch of rocks. In a food processor blend cauliflower until it resembles rice. Combine 3 cups of cauliflower “rice” with the eggs, mixing thoroughly. You can use the leftovers to make this delicious fried rice recipe. Add in tapioca starch, coconut flour, sea salt, and baking powder, stirring until combined. Fold in garlic and green onion. Set mixture in the fridge for 7 minutes to allow flours to soak up moisture from the cauliflower. Remove from fridge, form into 4 even sized balls and press flat onto baking sheet. The thinner they are, the crisper they will be. So if you’d prefer more of a flatbread style fritter then flatten it down quite thin. Bake at 375F until edges are a deep golden brown, approximately 40 minutes. Tip: These work great as a biscuit to make small, hand held sammies! Well that’s all for today friend! Have a wonderful week! And if you’re looking for a fun new way to experiment in the kitchen make sure you download my FREE Fantastic Fermentables E-Book by clicking here. It’s packed with simple and delicious paleo & vegan fermentation recipes to help take your health to the next level.